This function allows users to view and process open Deliveries, which are linked to inbound 850-based Sales Orders and filtered on processing status. To process an open Delivery, see Processing Deliveries. To process SOPI or SOTPI Deliveries, see Packing (SOPI and SOTPI). Delivery selection can be filtered by Customer Number (see marker 1 in the screenshot below), Posting Date range (see marker 2 below) , Status (see marker 3 below) and Due Date range (see marker 4 below) . Open Deliveries can be filtered by Customer Number (1), Posting Date (2), Status (3) or Due Date (4). Use this search field to filter by Posting Date range. Start date of the Delivery document Posting Date range filter. Use this search field to filter by Posting Date range. End date of the Delivery document Posting Date range filter. Not Complete – EDI Deliveries where the ASN (856) messages have not been sent or have not being flagged for manual processing. Sent – EDI Deliveries where the ASN (856) messages have been sent. Manual – EDI Deliveries flagged for manual processing. Use this search field to filter by Due Date range. Start date of the Delivery document Due Date range filter. Use this search field to filter by Due Date range. 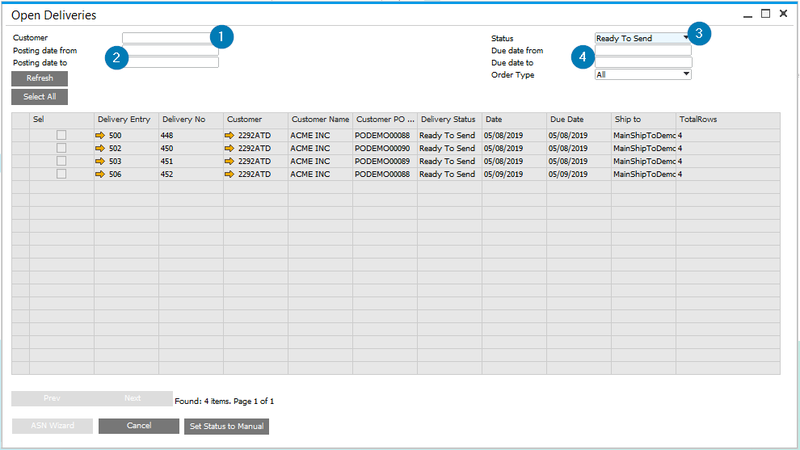 End date of the Delivery document Due Date range filter. If checked, select the Delivery for processing. Delivery DocEntry number. Press the golden arrow to open the Delivery details window. Press this button to process selected Delivery documents for creation of EDI ASN (856) messages to the Business Partner (Customer). Note: To select the delivery, click on first column (marked sel) for the Delivery row. Press this button to exit the Open Deliveries function.